When my mother-in-law was a young girl growing up in Vietnam, she would sell corn from a corn stand much like a hot dog stand. Instead of hot dogs, she’d grill up corn-on-the-cob and instead of ketchup and mustard, folks would slather on as much green onion oil as they wanted. She was well known as the cute girl with the corn stand. In fact, the corn stand is a crucial plot point in my in-laws’ young romance. See, the corn stand is where my father-in-law first saw my mother-in-law — a young, independent, business-minded woman who was out there just doing it for herself. (Well, for herself and her 7 siblings at home, but that’s besides the point.) My father-in-law knew a good thing when he saw it – they got married a mere 6 months later. Corn is sweet, just like true love. Whenever I grill corn with green onion oil, I think of my in-laws and how they’ve been together for over 35 years. They still hold hands, they still stay up late to chat with each other and they are still deeply, deeply in love. So, if you’re feeling sappy, or just hungry, grill up some corn! The sweetness of roasted corn contrasted with the savoury flavours of green onions, Thai red chili and fish sauce is something you don’t want to miss. 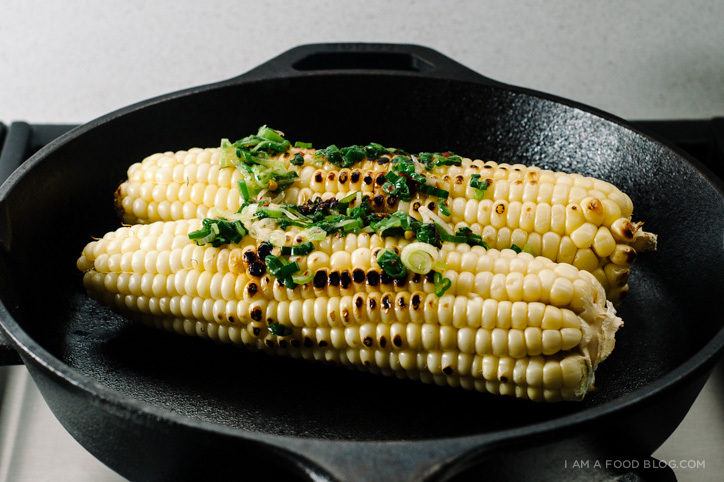 i am grilled, i am oiled: i am grilled corn with green onion oil! On the barbecue or in a cast iron grill pan, grill the corn over medium to medium high heat until the corn deepens in color and the kernels turn toasty brown, turning occasionally. Meanwhile, heat up the oil in a small deep sauce pot over medium high heat until the oil is hot and shimmery. Move the pot off the burner and add the green onions. Be careful! The onions will splatter. Stir and when the onions have calmed down a bit, add the chili and stir in the fish sauce. 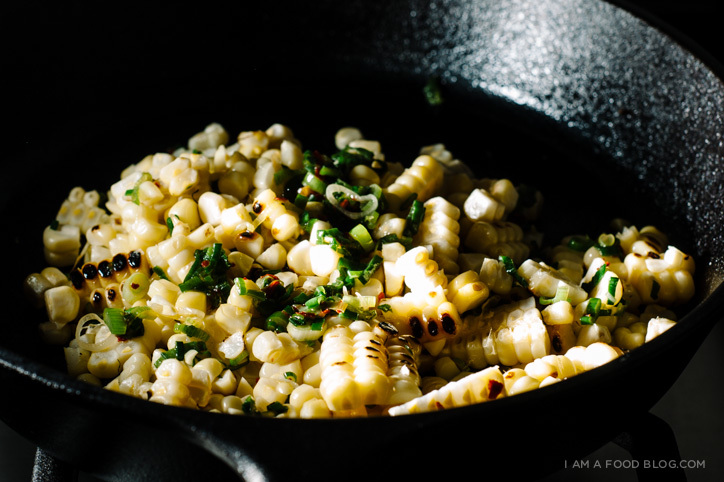 When the corn is slightly charred and hot, immediately spoon on the green onion oil to taste and enjoy. If you prefer corn off the cob, go ahead and carefully cut the kernels off and then mix with the green onion oil. This will make more green onion oil than needed. It is delicious on vegetables, eggs or even tossed with noodles. Love how simple this is!! Yum! Generally I’m all sriracha lime butter but hello green onion oil! Bring on corn season. mmm, sriracha lime butter sounds delicious too!! i see a corn bar with different toppings in my future!!! Love that story! Hooray for love. I’m goign to be making this the second we get corn at the market. Looks soooo good! 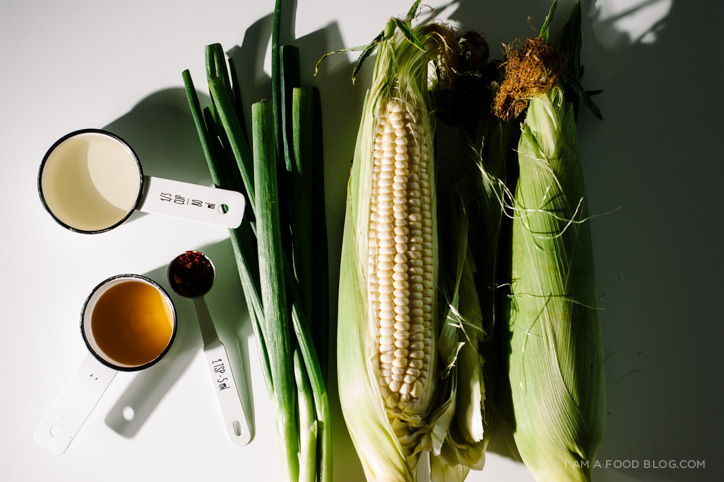 I love green onion oil but have never tried it with corn on the cob. Must do it soon! 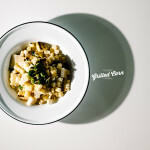 Making fried rice with green onion oil is out of this world too! YUM! I absolutely love stories of couples who have been together forever and are still so committed and in love, the best! Love the sweet story about your in-laws! Marriage is not particularly easy but I certainly hope I hold my husband’s hand and stay up late to talk 30 years from now :) This scallion oil is awesome and I never would have known to put it on corn! I’m so pumped for corn season now! i hope that i can be like that with mike too! corn season is the best! thanks sophie!! On a side note, intrigued by this green onion oil. It’s the first I’ve heard of it, and it sounds EPIC. Gonna give it a go when I pull out the grill next time! What a sweet story! That’s so cute. I love that they still hold hands and stay up late to talk to each other. 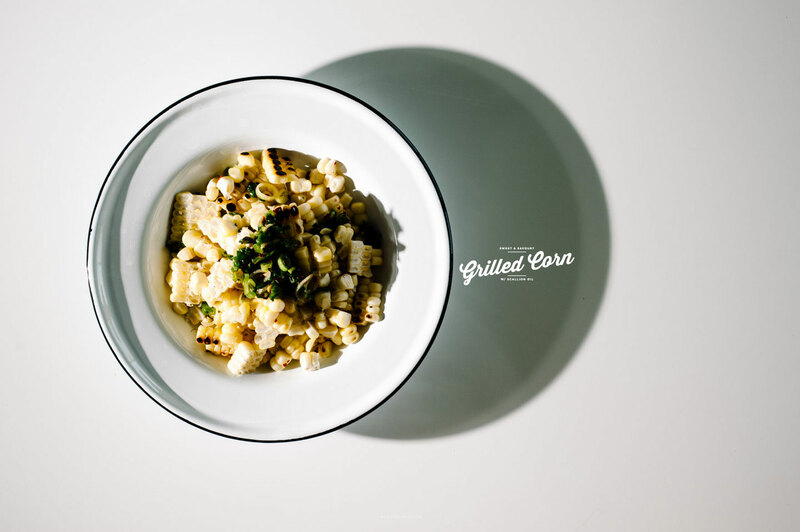 Grilled corn… mmm. 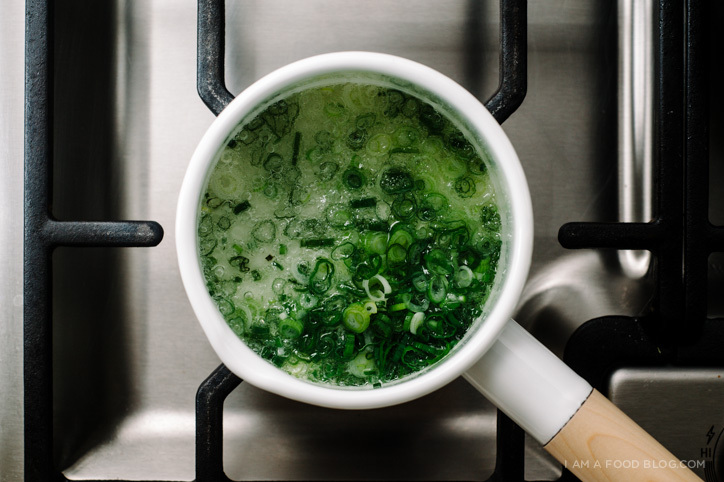 Green onion oil? Yes, please! grilled corn is the best!! Oh heck yeah. I’m in after looking at the flavor combination! OMG this looks absolutely AMAZING!! I love grilled sweet corn, SO MUCH!! What is that gorgeous white pan with the wooden handle? !